You are likely to need a surgical intervention for your hip problems if you experience hip pain that limits everyday activities, such as walking or bending or hip pain that continues while resting, either day or night or Stiffness in a hip that limits the ability to move or lift the leg or if you have inadequate pain relief from anti-inflammatory drugs, physical therapy, or walking supports and other conservative modalities. 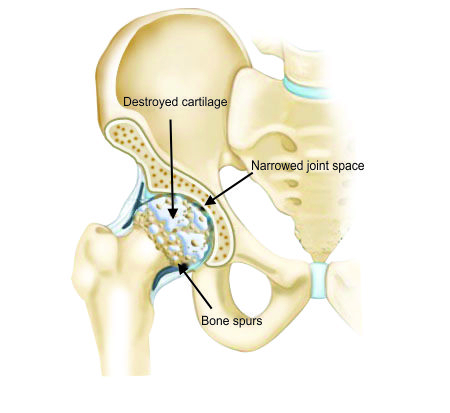 Total Hip Replacement is a surgical procedure in which your orthopaedic surgeon will remove the damaged part of your hip and replace it with metal or specialized medical plastic implants which will perform the functions of your hip joint. Your surgeon will remove damaged femoral head and replace it with a "Metal Stem" that is placed into the hollow center of the femur. The femoral stem may be either "Cemented" or "Press-fit" into the bone. A "Metal or Ceramic Ball" is placed on the upper part of the stem. This ball replaces the damaged femoral head that was removed. The damaged cartilage surface of the socket (acetabulum) is removed and replaced with a "Metal or Plastic Socket". Screws or cement are sometimes used to hold the socket in place. A "Plastic or Ceramic Spacer" is inserted between the new ball and the socket to allow for a smooth gliding surface. Most people who undergo hip replacement surgery experience a dramatic reduction of hip pain and a significant improvement in their ability to perform the common activities of daily living. Realistic activities following total hip replacement include "unlimited walking, swimming, golf, driving, hiking, biking, dancing, and other low-impact sports". With appropriate activity modification, hip replacements can last for many years. However, it should be noted that with normal use and activity, the material between the head and the socket of every hip replacement implant begins to wear and excessive activity or being overweight may speed up this normal wear. Therefore, most surgeons advise against high-impact activities such as running, jogging, jumping, or other high-impact sports. 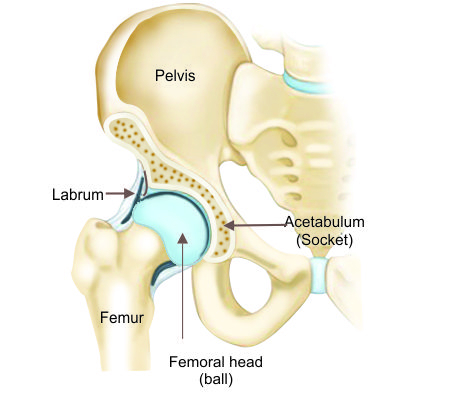 What are the signs which indicate the need for a hip replacement? Hip Pain: Feelings soreness or pain while or after exercising, the pain being a hindrance for daily activities etc can indicate the need for hip replacement. How long does it take to fully recover from hip replacement surgery? There are two stages of recovery namely short term recovery and long term recovery. Short term recovery: These are the early stages of recovery where the patient can get up and move out from the hospital after surgery. The patient is allowed to go home and rest on the third day. This also includes providing painkillers and helping the patient's sleep without medications. This time for such recovery is around 4-6 weeks. Long term recovery: This involves complete healing of the wound, including the internal tissues. When a patient feels normal and can perform the daily activities at ease, it can be said that the patient is fully recovered. The time needed for a full recovery is 6 months. How long do you have to follow hip precautions? The precaution should be strictly followed for 12 weeks post surgery. After 12 weeks, you can slowly start with minor activities which doesn't put much strain on the hips. The precautions are taken to help prevent dislocation of the new hip. After 12 weeks, your tissues will be healed enough that you can slowly start with a few more activities without substantially increasing your risk of dislocation. No patient with a total hip replacement should ever force themselves into an extreme position which may worsen the condition. Diet after total hip replacement surgery? What is the cost of total hip replacement surgery? Single hip replacement surgery would cost around 2.5-3 lakhs while Bilateral hip replacement surgery would cost around 5-6 lakhs. The price may also vary according to the region, type of surgery and the quality of the replaced product.